Société Aigle Azur Transports Aériens is an airline with its head office in Tremblay-en-France, France, near Paris, it is currently the second largest airline in France, behind the Air France Group. It operates domestic scheduled passenger services and international services to Algeria, Mali, Portugal, Senegal and France. It also operates charter, cargo and wet lease services. Its main bases are Orly Airport, Paris. Aigle Azur is also accredited by IATA with the IATA Operational Safety Audit (IOSA) for its safety practices. An Aigle Azur Douglas DC-3 arriving Manchester (Ringway) Airport on 3 April 1953. It is fitted with a ventral Turbomeca Palas booster jet for use in "hot and high operations". A Boeing 737-300 of Aigle Azur approaches Malta International Airport in 2004. In April 1946, Sylvain Floirat established the original Aigle Azur as one of the first wholly privately owned, independent airlines in post-war France. Between 1946 and 1955, the airline operated a large fleet of Douglas DC-3s. During the early 1950s, Aigle Azur began operating long-haul scheduled routes linking metropolitan France with Africa and the Asia-Pacific region. France's Ministry of Public Works and Transport had transferred Air France's traffic rights for these routes to the country's newly created independent airlines, including Aigle Azur. In 1970, the airline was re-constituted as a regional airline named Lucas Aviation. The re-formed airline's corporate and operational headquarters was at Paris Pontoise Airport, located in Boissy l'Aillerie. Lucas Aviation initially traded as Lucas Air Transport and operated regional scheduled services, including a year-round operation linking Deauville with London Gatwick. The name subsequently changed once more to Lucas Aigle Azur. An Airbus A320 in the airline's new livery landing at Toulouse Blagnac International Airport (September 2013). In May 2001, Groupe GOFAST acquired Lucas Aigle Azur from its previous owners, and reinstated the original name, Aigle Azur. The new owner refocused the airline as a mainstream short- to medium-haul scheduled and charter carrier. 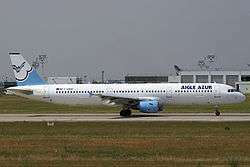 Aigle Azur began replacing its Boeing 737s with Airbus A320 family aircraft. It has 450 employees as of May 2007. A plane operated by Aigle Azur landed in Baghdad on 31-10-2010, becoming the first flight from a European airline to arrive in the city since the twenty-year-old international embargo began in 1990. On 23 October 2012, HNA Group announced that it completed its acquisition of a 48 percent stake in Aigle Azur in Paris, becoming its second largest shareholder, after Group GOFAST. In December 2012, Goldenflyer awarded the airline for "Best Cabin crew". The airline's administrative head office is in Tremblay-en-France, near Paris. The airline's registered office is in the 2nd arrondissement of Paris. An Aigle Azur Airbus A320 reg. F-HBAE in the airline's old livery landing at Athens International Airport (August 2008). The majority of Aigle Azur's international flights are to Africa and Europe (Algeria, France, Senegal, Mali, China and Portugal). Aigle Azur codeshares with Hainan Airlines. An Aigle Azur Airbus A321-200 at Paris-Orly Airport (2006). There were several hull-loss accidents involving Aigle Azur aircraft between 1949 and 1954, most of which took place in French Indochina, today's Laos or Vietnam. On 27 November 1949, an Aigle Azur Douglas C-47 Skytrain (registered F-OABJ) was shot down in a criminal occurrence near Dong Khe, where a major battle in the First Indochina War would take place 10 months later. On 9 July 1950, an Aigle Azur Douglas C-47 Skytrain (registered F-BFGL) crashed shortly after take-off from Casablanca (then in France), resulting in the 18 passengers and 4 crew members on board being killed. On 12 February 1951, another Aigle Azur Skytrain (registered F-OABK) was damaged beyond repair in a crash landing at Luang Prabang Airport (in today's Laos, then French Indochina). There were no fatalities. On 17 March 1953, an Aigle Azur Douglas C-47 Skytrain (registered F-BEFG) crashed during a bad-weather landing attempt at Da Nang Airport following a flight from Hue-Phu Bai Airport, resulting in the death of the eight persons on board. On 16 April 1953, another Aigle Azur C-47 (registered F-BESS) lost one wing shortly after take-off from Hanoi on a military charter flight to Nà Sản Airport. The aircraft subsequently crashed, and the 27 passengers and 3 crew members on board died. On 19 June 1953 an Aigle Azur Douglas C-47 (registered F-BEST) crashed into a hill after a fire started on board, killing the 29 passengers and 5 crew members (which makes it the deadliest accident of the airline to date). The aircraft was en route from Vientiane Airport to Saigon Airport. The wreckage could only be found ten days later. On 31 January 1954, the pilots of an Aigle Azur Skytrain (registered F-BGXD) which was due to operate a flight out of Dien Bien Phu Airport accidentally retracted the landing gear when the aircraft had not taken off yet, resulting in the airframe being damaged beyond repair. On 4 March 1954, during the First Indochina War, at around 04:00 local time, an Aigle Azur Douglas DC-3 (registered F-OAPC) that was parked at Gia Lam Airport, Hanoi, was destroyed by Vietnamese rebels. On 30 August 1954, an Aigle Azur Sud-Ouest Bretagne (registered F-BEHS) was damaged beyond repair during an emergency landing at Hanoi. On 8 January 2008 at 08:51 local time, an Aigle Azur Airbus A321-200 (registered F-GUAA) that was operating on Flight 258 from Paris-Orly Airport to Algiers Airport, was substantially damaged during a hard landing and subsequent tailstrike at its destination airport, during which a two-metre-long fuselage gash occurred. This was due to a faulty handling of the thrust lever by the commanding pilot (who was sitting in the right seat instead of the usual left one he was accustomed to). There were no serious injuries to the 59 passengers and 8 crew members on board, and the aircraft was reparable. 1 2 3 4 "Directory: World Airlines". Flight International. 2007-03-27. p. 51. ↑ "Directory: World airlines." Flight International. 16–22 March 2004. 53. ↑ LFPT – Pontoise Cormeilles en Vexin. AIP from French Service d'information aéronautique, effective 10 November 2016. ↑ "Contact us." Aigle Azur. Retrieved on 6 January 2011. "Headquarters 4 avenue Marcel Paul 93297 Tremblay en France - France"
1 2 "Contactez-nous." Aigle Azur. Retrieved on 6 January 2011. "Siège Social 36 rue des Jeûneurs 75002 - France" and "Services Administratifs 4 avenue Marcel Paul 93297 Tremblay en France - France"
↑ "Profile on Aigle Azur". CAPA. Centre for Aviation. Archived from the original on 2016-10-30. Retrieved 2016-10-30. Gradidge J.M.G. DC-1 DC-2 DC-3 The First Seventy Years. Air-Britain (Historians) Ltd. Tonbridge, Kent. 2006. ISBN 0-85130-332-3. Wikimedia Commons has media related to Aigle Azur.